680. Mein, A. March 17. Blowing and moulding bottles.  The inverted two-part mould E may be opened by hand or by suitable mechanism. 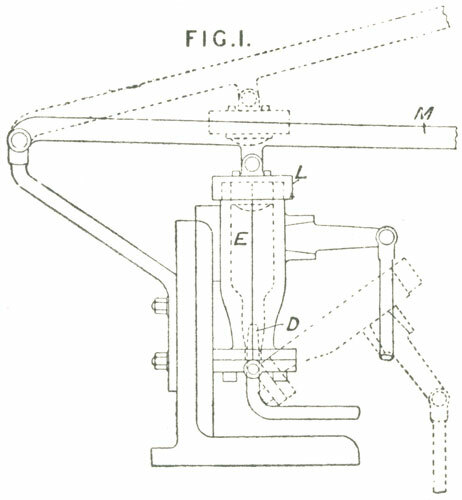 A core or nozzle D, for moulding the neck and for admitting compressed air for blowing the bottle, projects into the neck part of the mould, as shown. The mould is fitted with a cover L, which can be raised or lowered by a lever M.
871. Garrett, J. April 7. Handles &c. attaching.  Glass bowls of drinking-vessels are mounted in a setting of metal. Fig. 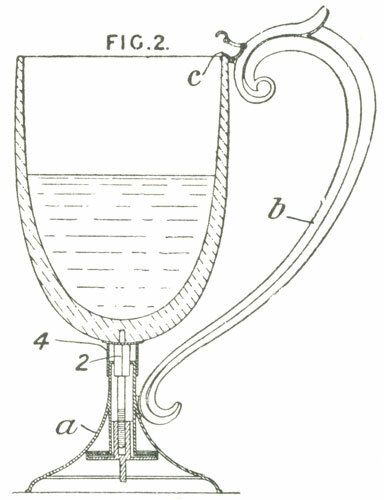 2 is a section of a glass goblet, supported on a metal base a, and secured by a clip c to the handle b. The bowl may be sprung into its metallic fitting. An adjustable pin 2 fits in a recess in the bowl, so that the metal frame may be fitted into various sized bowls. A cap 4 attached to pin 2 forms a seat for the bowl. As applied to a tankard, the handle is provided with a hinged metal lid, and the retaining pin is pressed into a recess in the tankard by means of a spring. 1153. Pearsall, R. May 7. Moulding; blowing.  Relates to the manufacture of glass shades of an oval, square, or round or cylindrical shape. The sides of the moulds in which oval and square shades are made are arranged to be moved towards or from each other, to adjust for different sizes of shades and to facilitate their removal from the moulds. The sides b, Fig. 3, of the mould are made of wood, and are supported by screws in frames a, one of which is fitted with a bevel-wheel g gearing with four wheels h carried on four radiating spindles i. These spindles terminate in bevel-wheels m, which gear with internally-screwed bevel-wheels n supported by bearing bosses at the four corners of the frame; the screwed bosses work on the screws o connecting the two frames, by means of which the frames and mould sides b are brought towards each other or separated. For square shades, two ends are provided to the mould, and these are actuated similarly by mechanism. In a modification, a large central spur-wheel, actuated by hand, replaces the central bevel-wheel and gears directly with spur pinions on the screws o. Round or cylindrical shades are made by blowing in a mould, to obviate the necessity for reheating the glass. 1953. Balmain, W. H. Aug. 27. Delivering molten metal; obtaining metal.  To remove each portion of the glass mixture from the furnace immediately it is vitrefied, the raw material is heated on one bed of the furnace built horizontally or nearly so. The liquid metal runs down an adjacent inclined bed, either into water and collected as cullet, or into a conical pot having an aperture near the bottom kept hot to allow the contents to flow. 2663. Hubart, A., and Cantillon, V. Nov. 24. Moulding. 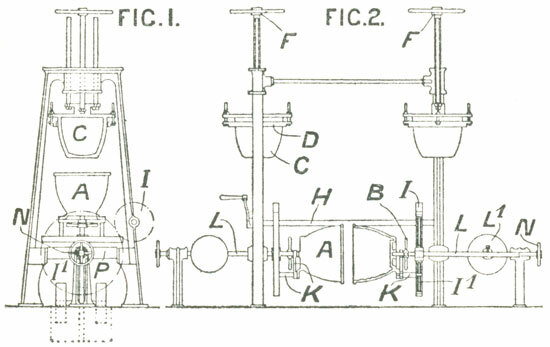  Casks, barrels, and other like vessels of glass are cast, moulded, or formed by apparatus such as that shown in Figs. 1 and 2. The vessels are made in two parts in moulds A, the parts being then joined by a band of glass by means of blow pipes with several jets or burners. 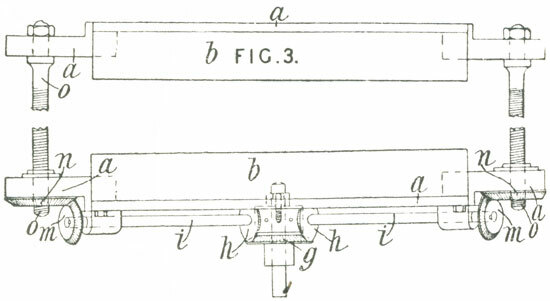 The moulds are carried on the ends of shafts L having counter­weights L1, which are mounted between the standards of the framing on shafts P, so that the moulds can be turned vertically, as shown in Fig. 1, to receive the molten glass to form the parts, and turned into the horizontal position, as shown in Fig. 2, to unite both parts together. The moulds are made in three parts, the two parts forming the sides being hinged together, and the third forming a movable bottom being adjustable by screws B. Mounted on the upper part of the framing are cores C actuated by screws F to lower them into the moulds. The cores are fitted with movable rings D, which serve to lengthen the moulds and to leave uncovered the parts of the vessel to be joined. When the moulds are brought into the horizontal position, the parts to be joined are brought together by set-screws N. The moulds are then rotated from the shaft H, through the gearing I, I1, while the blow pipes operate. The frames and rods K fixed to the pinions I1 hold the lateral parts of the mould when the bottoms are removed. The finished vessel is then removed to be re-baked. 2751. Short, C., Smeeton, T. B., and Bowler, W. Dec. 5. Materials; moulding; annealing; ornamenting.  Bricks, slabs, tiles, and drain pipes are cast from slag in ornamental or other moulds, where they are left for ten minutes, and then removed to an annealing-furnace, where they are treated for five or six days. 2827. Withers, G. Dec. 13. Blowing; moulding; shaping.  The wooden block, used in blowing sheet glass, shades, &c, is replaced by a hollow metal one, which may be rotated in either direction to assist the operations of shaping and moulding. The metal block is kept at an even temperature by connecting it to a hot water reservoir. As soon as the water in the reservoir boils, a valve is opened by the pressure of the steam and admits cold water. Two or more metal blocks may be connected to the same reservoir. Any fatty substance may be applied to the surface of the blocks to render the glass clearer. 2935. Geyelin, G. K. Dec. 24. Shaping.  Glass, either solid or in tubes, is twisted in one or more threads round a mandrel, which is afterwards withdrawn. 2943. Spilsbury, F. G. Dec. 24. Transparent and translucent materials are made by treating muslin, tissue paper, cardboard, skins, &c. with a solution of potassium or sodium silicate, or both, either alone or mixed with potassium or sodium phosphate, borate, or tungstate. For example, the paper is preferably first treated with oil, or a strong solution of fat or resin soap, or a solution of resinous matter in spirit or other liquid, and then with the soluble glass. Or a sheet of muslin may be placed on the paper, and after treating both, they are dried and pressed into one fabric. A sheet of stamped, pierced, or perforated paper may also be backed by one which has been treated as above. The material may be used as a substitute for wire window blinds, as tracing paper, for candle and like shades, as the casing for holding tallow &c. in the manufacture of shadowless night-lights, and for decorative purposes. In the Provisional Specification, leather, and silk, net, and hair fabrics are stated to be treated similarly, and used for en-casing candles, and for making lamps to contain tallow, oil, &c.